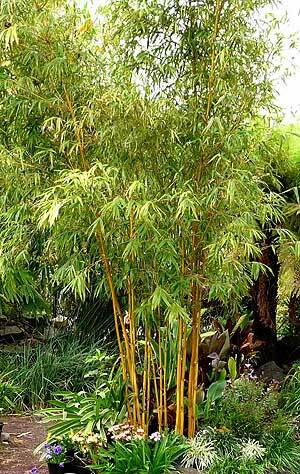 A non invasive or ‘clumping’ bamboo, China Gold bamboo lives up to its name with bright golden canes with some green striping. An excellent ornamental bamboo, reaching around 6m in height. Over time it will form a good 2m + clump. Use as screening plant and you will find that it maintains foliage all the way down the stems. This is a fairly open growing species, the canes are not usually close together, so it can give a wonderful look in clump. This is an easy care bamboo that will reach its full height in 3 around years. Grows well in full sun to part shade and a humus rich well drained soil will be sufficient. Water well when planting, usually fairly drought tolerant once established. You can decide to prune away the lower foliage to reveal the golden canes, or leave it to provide a screen to ground level. Open in natural growth it is easy to clean between the canes of China Gold bamboo for a formal clean look in the ornamental garden. Growth Rate – Will reach 5 – 6 metres in height in 2 – 3 years depending on conditions. Where can you buy China Gold Bamboo? China Gold Bamboo is available for sale from the following suppliers.